Go, Tracy, Go! : Feeling flush? I'm against this, sort of, but for complicated reasons. What I'm against is that when it comes to large races like the NYCM, there is no longer any pretense of running being something that's open to everyone. I know that. It's no longer the "lace up your shoes and go" sport that many of us love. But at the same time, I get that running is a business and I get that it's hugely expensive to put on a race like New York. When I started running, I started running for me. I didn't wear a fancy watch, I didn't run any races, I just went out running most days of the week. I tried new running routes because I wanted to explore. If I was tired, I didn't go running. If I wasn't tired, I ran longer. I didn't keep track of how far I ran and I never knew how fast it was, but just how it felt (usually "good" or "sucky"). I ran because I could and because I wanted to and because it made me feel good about myself, most of the time. When I ran my first marathon, a couple of years after I started running, it wasn't a metaphor for life or proof that I was a superhuman who could do anything I set my mind to. It was just something that shook up my running routine for a few months and gave me a goal and my running some focus. 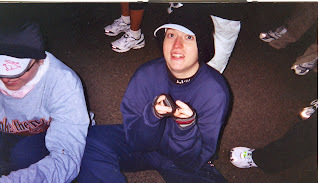 And yeah, I was proud of myself after, but I didn't dwell too much on the marathon's place in my life... it was just an extension of the fact that running had a prominent place in my life. But it's not like that for everyone. Especially in New York, running is all about your times and your training schedules and your races. People here are competitive, and many runners here have the means to be competitive. In New York, more than anywhere else that I've lived and run, you can buy the right running clothes and buy the right coaching and (through charities) buy entry into the marathon and therefore effectively buy a prepackaged life experience. Again, it's personal and I am not intending to denigrate anyone's running/marathon experience. I just know what running means to me (cue "sentimental music") and I want it to mean that to everyone. I want running to be a part of everyone's life. I want it to be a constant: their solace in bad times, their celebration in good times, something that's so hard you want to give up some days and so gloriously effortless that you never want to stop other days but overall is just uniquely personal, a part of who you are, and available to everyone. I get caught up in it as much as the next person, but running is not about medals or racing or finish times - it's about you. I'm way more impressed with someone who's been running regularly for years than I am with someone who ran a marathon, once, and then promptly lost interest in running. I'm with you on this one. I like the big races - a lot -, but things like this make you appreciate the small ones, because in these races it's actually just about the running. I'm glad to see that someone else shares my feelings! I do love a big race - there's something so awesome about the crowds cheering you on for the whole route! But, at the heart, I love running for me the most. Just found your blog and what an amazing pos!! I love running, I'm so passionate about it that frequently I choose not to race because I then get all caught up in numbers instead of just it being about the movement. I didn't recognize myself in this photo. I love that it was so cold I couldn't even look up at the camera...just sat there shivering, waiting for death to take me. I just came across your blog, and I love it. I just put on my Google Reader list, and look forward to reading more. Thanks, everyone! Especially Amanda and Sean for checking out my blog. And ha, Mandy, I added a photo credit for you.